Second, to calibrate or optimize the optical defects between images, such as the exposure differences, distortion etc..
At last, blending, it's the process to merge and remap the images into a final seamless panoramic photo. 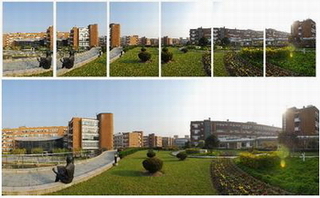 The panoramic photo stitched by photo stitch software can show 360 degree field of view of the location, which is usually used for showing real estate properties, events, and tourism, it is also widely used for website design, multimedia design and even the crime scene investigation. What types of photos can be stitched by photo stitch software Panoweaver? Professional photo stitch software Panoweaver can stitch any type of photos together. Different equipment will get you different type of digital photos. What type of photo can I get after photo stitching process with Panoweaver? Depending on the type of digital photo you have taken with your equipment, you can stitch photos into a 360 degree panoramic photo, 360 degree cylindrical photo or wide angle photo. A 360 degree spherical photo reaches 360*180 field of view. A 360 degree cylindrical photo reaches 360 degree horizontally and less than 180 degree vertically. How to view the stitched photos in immersive players? Panoweaver can execute both photo stitch and panoramic photo publish process. After the photos are stitched, they can be easily published into popular panoramic photos players supported formats, include Html based Flash VR, QuickTime movie (*.mov), standalone swf (*.swf), and Easypano virtual tour player (Java platform needed), HTML5 panorama for iPhone, iPad. Thus, it can be viewed on PC, iPhone and iPad. Click above two panoramic photos to see them in QuickTime player, as well as Flash virtual tour orHTML5 virtual tour crated by Panoweaver. View more panorama photos in various players in panorama gallery. Would you like to try photo stitch software Panoweaver? Download free trial here and check more information about Panoweaver about its advanced features.